Search When autocomplete results are available use up and down arrows to review and enter to select. Touch device users, explore by touch or with swipe gestures. Here's a great app that allows your family and friends to keep track of your boat's travels using the AIS system. It's an app called Marine Traffic, and it's used all over the globe by both commercial shipping and recreational boaters. The author's boat is at home in its slip, and is visible on the Marine Traffic app. I have added the photo with spinnaker to my boat's Marine Traffic home page. If your boat has a Class A or B AIS transceiver onboard, Marine Traffic (MarineTraffic.com) makes your boat visible. 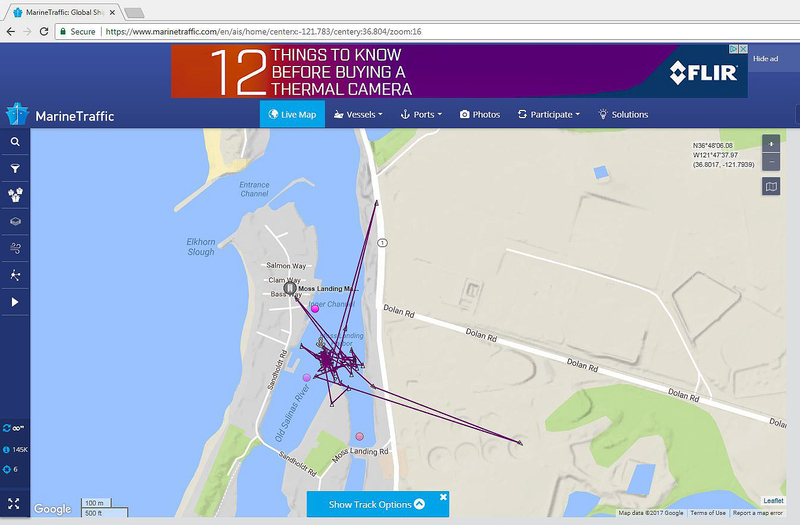 You just leave the AIS turned on and you can see where your boat is and be notified via email when it moves. This is a handy free website to share with your family and friends, and when you are out on the water they can go online and follow the progress of your voyage. This app only works when the vessel is in range of the AIS network, so it doesn't work when you're far offshore. Anyone can browse the free website, but boat owners can purchase the app. You can purchase mobile versions for the iPhone, iPad, Android or Windows devices here. 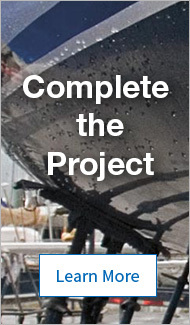 Then you can add photos and details about your boat. One thing to know about Marine Traffic is that it requires AIS ground stations to relay a boat's location and track. It's also dependent on the limited range of your boat's AIS, which is a cousin to your boat's VHF radio. Both have a maximum range of about 25 miles and transmit via line-of-sight. I learned about these limitations when delivering my boat up the coast to a harbor 80 miles away. There's one stretch of coastline that's unpopulated, and my friends always lose track of me when I'm motoring there. My track will disappear for 20 miles or so. The second oddity of Marine Traffic is that it will display "phantom motion" when a boat is sitting still in its dock. I have configured Marine Traffic to send me an email message when my boat leaves and returns to its slip. These automatic messages are a free way to know if sombody has stolen your boat, assuming that I leave my AIS transceiver turned on, and that the ne'er do wells who have stolen the boat haven't noticed this fact. Yikes, did someone just steal my boat? I have received a few of these messages while sitting at work, and was pretty panicked the first time; "What the heck! Has somebody purloined my boat!" The GPS track looks like the screen-capture below. I am still trying to find out if this interesting glitch is caused by my boat's NAIS400 AIS transceiver unit, the Active NSPL splitter, my antenna connection or the local shore AIS station at the nearby marine laboratory. 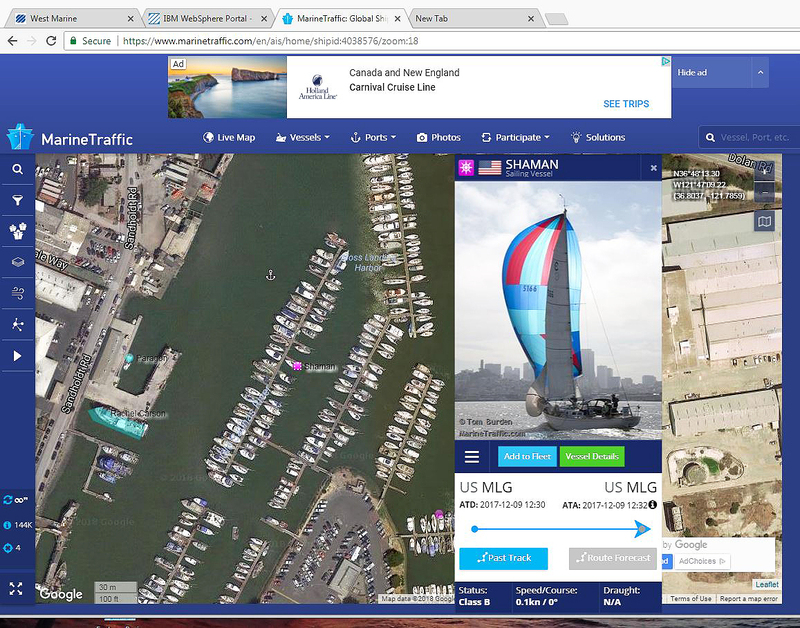 All interesting glitches aside, the free Marine Traffic app is an enjoyable way for you and your friends to see your own boat, or any other AIS-equipped shipping traffic, anywhere in the world, from any location where you're logged onto the Internet. A real "connected boat" experience! The app showed my boat traveling (over land, at up to 37.5 knots) while stationary in its slip.